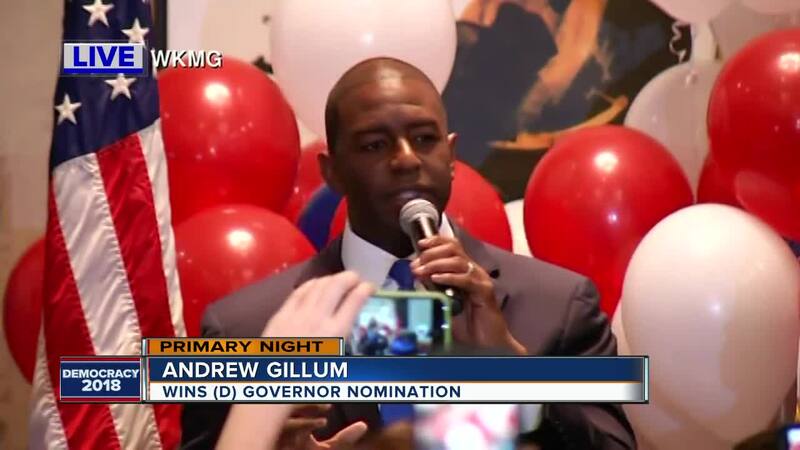 TALLAHASSEE, Fla. (AP) — Tallahassee Mayor Andrew Gillum won the Democratic primary for Florida governor Tuesday, pulling off an upset against better funded and better-known candidates on his quest to become the state’s first black governor. Gillum will now face GOP nominee U.S. Rep. Ron DeSantis in November to replace Republican Gov. Rick Scott. DeSantis sailed to victory in the Republican primary, defeating a longtime favorite of the GOP establishment with a campaign based largely around President Donald Trump. Gillum spent the least of the five major candidates in his primary race and had the smallest television presence. He relied on a grassroots campaign and the support of the furthest left in the party to beat four other candidates, including former U.S. Rep. Gwen Graham, the daughter of popular former governor and U.S. Sen. Bob Graham. Gillum, 39, was a favorite among Democrats who call themselves progressives and earned the endorsement of former Vermont Sen. Bernie Saunders. Gillum was a 23-year-old Florida A&M student when he became the youngest person elected to the Tallahassee City Commission in 2003. He was elected mayor in 2014. Besides Graham, Gillum turned back former Miami Beach Mayor Philip Levine, who poured $29 million of his personal wealth into the race and saturated the state with 30 different campaign ads. Also in the race was billionaire Jeff Greene, who spent about $38 million of his own money on the race, and Orlando area businessman Chris King, who spent about $4 million of his personal wealth on the race. Gillum was the only candidate who said he’d raise corporate income taxes, and he often talked about winning a lawsuit against the National Rifle Association during his time as mayor. He often said he was the only candidate in the race who wasn’t a millionaire or billionaire. But the win also comes as the FBI is investigating corruption at city hall. Gillum has said he is not a target in the investigation. While he didn’t make race an issue, Gillum said it during a recent interview that it would be “big” to be Florida’s first black governor. In the Republican primary, DeSantis beat out Agriculture Commissioner Adam Putnam, who had seemingly built up the run for governor his entire adult life after being elected to office as a 22-year-old. 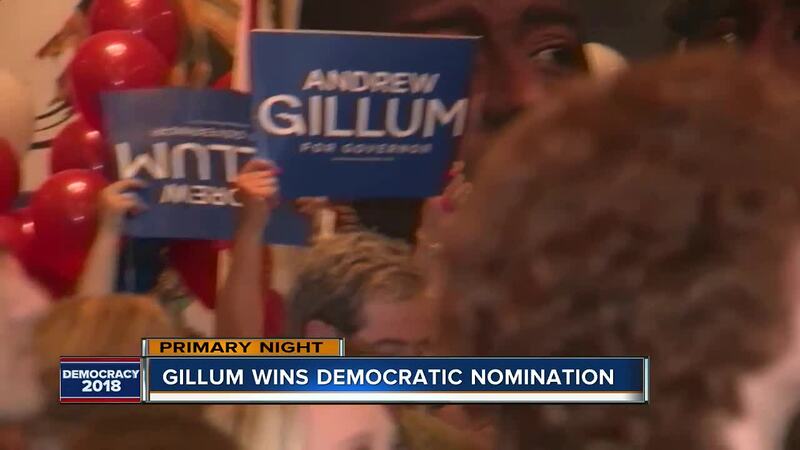 The strategy worked, and many voters say that’s what convinced them to support DeSantis. Sharon Grant said she was planning to vote for Putnam — until Trump weighed in on the race. Josie Parke, 68, an interior designer in Coral Gables, said Trump’s backing swayed her vote for DeSantis, too. “I believe in Trump’s policies and while I don’t love the way he opens his mouth too much, sometimes saying things that are not quite appropriate, I do believe that in his heart he really means well. He’s doing things the way I like,” Parke said. DeSantis entered the race a month after Trump’s December tweeted that he would make “a GREAT governor.” Later Trump held a rally for him in Tampa. Suddenly, he was considered the favorite over Putnam, who raised more money, campaigned longer, built support among the party establishment and ran a traditional grassroots campaign. DeSantis, who turns 40 next month, is a former Navy lawyer. He also ran for Senate in 2016 but dropped out when Republican Sen. Marco Rubio shut down his presidential campaign and decided to run for re-election. Supporters at DeSantis’ party in Orlando chanted “Ron! Ron! Ron!” when he was declared the GOP nominee Tuesday evening. Voters are also picking the nominees for two Cabinet positions and several congressional seats. Copyright 2018 Scripps Media, Inc. The Associated Press contributed to this report. All rights reserved. This material may not be published, broadcast, rewritten, or redistributed.